Geeks, Nerds, Sci Fi Fans: lend me your ears, and I shall help you cover said ears with big floppy earflaps. This listing is for one adult sized wool blend Firefly Inspired Cunning Hat. With that, please note that this orange and yellow knit hat is not made by, endorsed by or in any way affiliated with any individual or organization that originally aired, and quickly cancelled, a short lived, but much loved Sci Fi series featuring a male character with what some might call a girl's name. 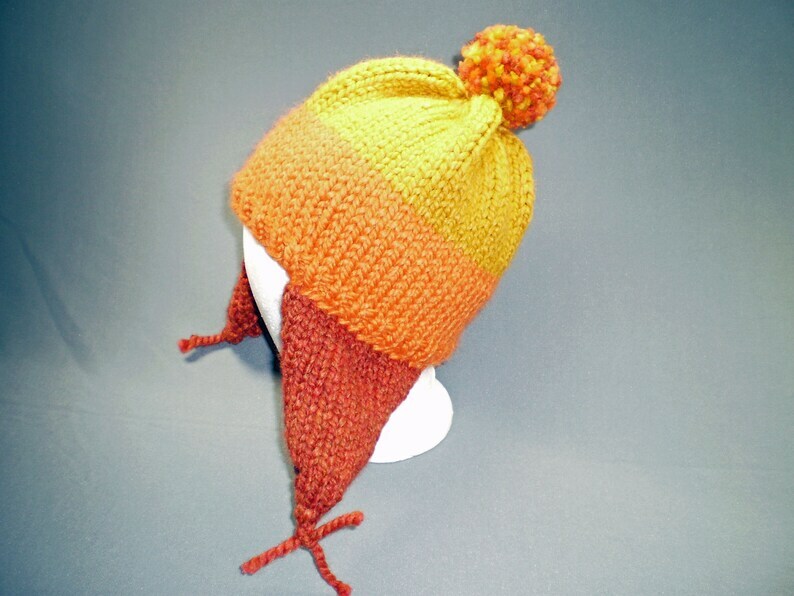 Granted, it does look an awful lot like a Jayne hat. Even though it looks a lot like the hat worn by Jayne Cobb on Firefly, it is for sure NOT an "official" Jayne hat. This warm, functional knit winter earflap hat was just handmade by me--most likely while I was reveling in the nerdy goodness of some Whedon inspired show. The final picture in this listing shows the yarn colors. Please note that some have commented that the dark yellow color has a brownish tint. Please note that it is a darker yellow, Goldenrod color. This adult orange and yellow hat measures 20" across the brim lying flat and stretches to up to 25". In short, it fits my daughter's preteen sized head, my normal sized woman head and my husband's big giant man head as well. This orange hat is appropriately sized for child, for teen, for man, for woman or for adult. - I work with a woman named Jayne. - I went to college with guys named Torrence Cobb and Clayton Cobb. Although many people thought they had some kind of family alliance, they were not related. - I have never been to Canton, OH. - My spring coat is a Browncoat. - I often refer to the Serenity Prayer when making life decisions. - I only recently learned that a firefly and a lightening bug are the same thing. - I often lose my focus and blame it on having seen something shiny. To view all of the hand knit hats in the Mellow Fury Store, including slouch hats, chemo caps, monster hats, wool hats and hats for men visit http://mellowfury.etsy.com. As always, handmade with 100% rechanneled aggression. Bought this as a gift, and the Nerd loves it! It's perfect! Looks amazing and fits great. I love it! Comic Book Inspired Hat: Captain Marvel No. 9 Carol Danvers Lucky Hat - Made to order. Paypal or credit card payments. Refunds within 2 weeks of purchase only. Buyer is responsible for the cost of return shipping. Our goal is to have happy customers who speak well of us. If there is an issue, please contact us and give us a chance to make it right. Items are shipped on Tuesdays and Fridays in most weeks. Most items are shipped domestically using US Priority Mail or US First Class Mail. Visit the Mellow Fury Etsy store again soon! Be sure to keep current on all things mellow and furious at http://www.facebook.com/mellowfury, on Twitter at @mellowfury and on the Mellow Fury website at www.mellowfury.com.